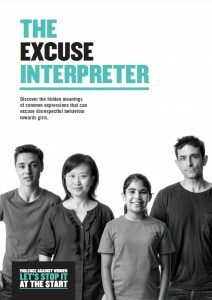 Discover the hidden meanings of common expressions that can excuse disrespectful behaviour towards girls. 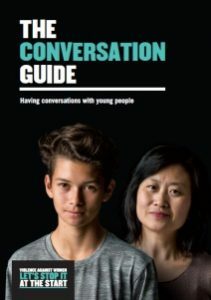 What adults say when males are disrespectful or aggressive toward females shapes young people’s views about what is and isn’t acceptable – or what might be okay in certain circumstances. But our language can carry hidden meanings. The things we say in front of young people can be interpreted in ways we don’t intend. Without meaning to, we can say things or use words that excuse disrespectful behaviour towards women. You can use the Interpreter to become more aware of your reactions in these situations. It will help you avoid seemingly harmless phrases that might send mixed messages to young people about respect. This is when we brush off or try to lessen the seriousness of disrespectful or aggressive actions. I shouldn’t get upset when he insults me. It’s okay to do it if you like them. I’m making a fuss about nothing. I shouldn’t take it so seriously. I can get away with this. I shouldn’t get upset about this. It’s okay to make sexist jokes. It’s okay for boys to disrespect me. It’s not my fault if she makes me angry. If I just accept it, he’ll grow out of it and it’ll stop. I have the right to act this way. It’s just what boys do – I should get used to it. We’re just like that, it’s fine. I’m not responsible for this. Sometimes we shift the blame when a boy is disrespectful or aggressive towards a girl. This may imply that she must have done something to provoke the behaviour, or manipulated the situation. I probably did something to start it. She started it, so my actions are okay. Gender stereotypes are labels that reinforce outdated ideas of how men and women should behave. Popular phrases imply boys should take control and supress their emotions, and girls should be passive and accommodating. While it may not be our intention, these comments often have a negative effect on the confidence and self-esteem of young people. If we continue to use words and phrases like these, the outdated ideas about male and female roles will go on. “Man up” Men need to be tough. “Stop acting like a girl” I’m too soft. “Who wears the pants?” I should be in control of the relationship. “Boys don’t cry” I shouldn’t express my emotions. “She has you under the thumb” She’s in control of me. “You’re so whipped” I shouldn’t value what my girlfriend wants to do. “She’s such a bossy boots” I shouldn’t be assertive. “She’s a feisty one” I shouldn’t give my opinion / I shouldn’t stand up for myself. “Why are you being so uptight?” I shouldn’t have boundaries. “She can be a real know-it-all” I shouldn’t say things that make me sound clever. “She’s a bit of a tomboy” I shouldn’t be myself / I shouldn’t play the sports that I like / I should look more feminine / I shouldn’t dress the way that I like / I am judged on my appearance. “She’s a little princess” I shouldn’t be myself / I should look less feminine / I shouldn’t dress the way that I like / I am judged on my appearance. Reflecting on our own attitudes, which might excuse disrespect, and being aware of the things we say to young people is the first step towards making a change. By talking to young people about respect, we can have a positive influence on their attitudes and behaviours as they grow into adults. 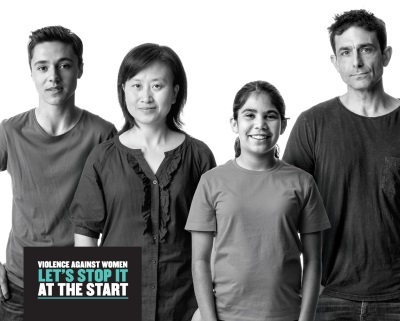 Advice and tips for discussing sensitive issues and having open discussions with your children. 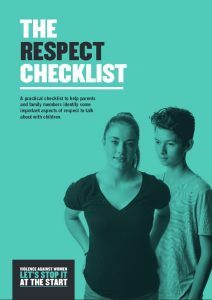 A practical checklist to help parents identify some important aspects of respect and gender equality to talk about with your children.